Grape harvesting, vine maintenance and local sourcing are only some of the ways wineries across the United States are becoming more sustainable throughout the winemaking process. Not only are some of the country’s top wine destinations environmentally conscious, but some have special events – such as concerts and local festivals – all summer long! There are almost 30 million annual winery visits in the United States alone, according to the National Association of American Wineries. Typically, visitors just participate in a wine tasting or go on a tour of the winery’s facility, but why stop there when you have access to so much more? Check out some of the following sustainable wineries from leading wine-producing states such as California, New York, Oregon and more! Spanning 120 acres southwest of Portland, Cooper Mountain Vineyards has four separate vineyard locations committed to sustainable and organic practices. Cooper Mountain Vineyards began in 1978, selling its grapes to other local wineries. In 1987, it began making its own vintage. Now, the winery produces five varietals that involve astronomy, homeopathy and geology practices to create Demeter Certified Biodynamic® wine. Just 30 minutes from downtown Portland, the Cooper Mountain Vineyards tasting room is open daily and offers tours to explore the green way the vineyard makes its wines. Celebratory events happen throughout the year, such as its Harvest Celebration, Memorial Day Weekend Open House, Annual Thanksgiving Weekend Open House and Neighbor Nights – all featuring live music, tastings and light food. Wine enthusiasts can even join the 5 Elements Society wine club, where they receive discounts on bottles of wine, complimentary tastings and invitations to all their events. DuCard Vineyards sits on the eastern side of Shenandoah National Park in Etlan, Virginia. Initially, it grew and sold its grapes to a nearby winery, but when the grapes started to win awards – such as the Virginia Governor’s Cup – the vineyard decided to bottle some wine under its own label. As a former apple orchard, the vineyard grows four grape varietals, including cabernet franc, norton, petit verdot and viognier. As it has grown, DuCard Vineyards has expanded production and operations with sustainability practices in mind. Awarded the Virginia Green Travel Star, the vineyard has been recognized as one of the greenest wineries in the state, according to its site. Some of DuCard Vineyards’ sustainability accomplishments are sourcing locally, installing solar panels, using reclaimed materials, composting grape waste and more. In addition to experiencing DuCard Vineyards’ wine tasting and food pairing events, guests can hear live music on the patio, go stargazing on the vineyard grounds or attend its gourmet food and wine pairing event. Also, DuCard Vineyards holds a Wine-appalooza Festival in June, where visitors can check out local craft tents, eat barbecue and sip on wine. Sitting atop Torrey Ridge in Penn Yan, New York, Fox Run Vineyards planted its first grapes in 1984 and opened its doors to its winery in 1990. Originally a dairy farm, Fox Run Vineyards converted existing facilities to operate sustainable winemaking. In 1996, a new facility was built overlooking Seneca Lake and in 2001, the original dairy barn that once housed winemaking was converted into a wine center for tastings and events. Fox Run takes pride in its sustainable practices with its vineyard and cellar, focusing on low-impact agriculture and protecting the surrounding ecosystem. The vineyard follows the Agricultural Environmental Management Tier III conservation plan, making it a prudent winery that takes into account its surroundings. The vineyard offers winery tours and group tastings, and even a café that offers food that pairs well with its wines. Fox Run Vineyards also hosts an annual concert that kicks off its Glorious Garlic Festival Weekend. The festival features wine and food tastings, with endless entertainment. The vineyard invites several vendors that allow visitors to experience local art, crafts and food from all over Central and Western New York. Known mainly for its sparkling wines – or cuvées – Iron Horse Vineyards is a family-owned winery located in Sonoma County. Its 160 acres of land exclusively grows grapes that produce chardonnay and pinot noir. From those grapes, Iron Horse Vineyards produces eight types of pinot noir, six types of chardonnay and 12 cuvées. When growing and harvesting its grapes, Iron Horse Vineyard management prioritizes the land’s long-term sustainability needs. They follow a “precision farming” process, meaning they irrigate with recycled water and prune, maintain and harvest grapes by individual section or vine. The pruned resources don’t go to waste either. The vineyard mulches and chops any grape scraps to be used in the soil. In addition to its eco-friendly growing processes, Iron Horse Vineyards donates $4 per bottle sold to reduce over-fishing and to establish marine protected areas. Aside from wine tastings and tours, Iron Horse Vineyards holds a variety of summer events such as Oyster Sundays and Make Your Own BLT parties. Also, this year marks the vineyard’s 40th anniversary event, where visitors will enjoy lunch in the garden as well as indulge in dessert and – of course – wine! When it opened its doors in 2001, RayLen Vineyards & Winery was only one of four wineries in the North Carolina Yadkin Valley. Now, it is one of more than 20 wineries in the valley and produces more than 10,000 cases of 16 wine varietals. The vineyard has won several awards and is deemed one of the best wineries in the Southeast by Wine Spectator. Also, RayLen Vineyards & Winery is known for being the greenest winery in North Carolina. There are more than 100 solar panels on the property, which is enough to offset half of the winery’s annual energy cost. Since installation, RayLen reports that the solar panels have prevented approximately 14,000 pounds of carbon emissions. 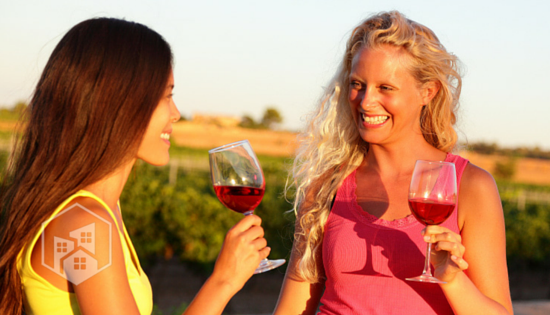 RayLen Vineyards & Winery visitors can attend wine tasting, tours and festivals all year long. Open houses occur five to seven times a year, and people can enjoy festivals up to five times a year. These events feature musical performances, souvenir wine glasses and North Carolina sunsets.